I received a three pack recently from Loch Fyne of the UK. 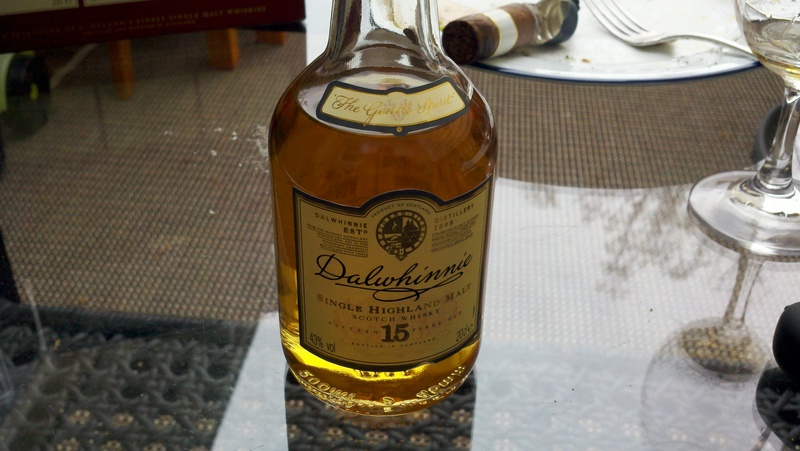 It contains Glenkinchie 12, Dalwhinnie 15, and Oban 14. They are three scotch whisky’s that represent the “lighter” side of scotch. The Single Malt Whisky Flavour Map, put together by Diageo and David Bloom places the Dalwhinnie 15 at dead even between the smoky and delicate sides and solidly in the Light category (as opposed to Rich). When I first nosed it I noticed some highland characteristics, Macallan like which lies on the far end of the Rich category but on par basically with being between Smoky and Delicate. After tasting it I understood. This is a really good whisky and is quite light on the palate. But it is not light on flavor by any means. To me it is quite floral and exhibits great fruit like ability. Its described as a good aperitif in MJ’s single malt scotch guide. The whisky is self-titled as The Gentle Spirit, I agree. I was tasting this while outside just enjoying a post lunch smoke and it actually complemented, to an extent, the medium flavored cigar. The cigar is a Cortez, a boutique type cigar with headquarters in New Jersey (of all places!). If you are trying to find a place to start drinking scotch, you would do yourself good to start with this excellent spirit.